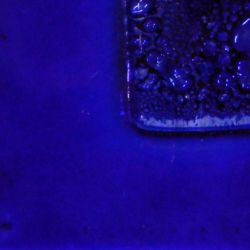 Sapphire is one of the totally transparent colors in the Original Colors line. Color fires to a rich, dark royal blue color. Product should be the consistency of whole milk and applied in a "puddle, push, pull" method for even coverage. Colors can only be mixed with other "T" series colors to form new colors but they can be used on the same piece and can be blended into other color families. Color will bubble when fused between layers of glass. Contains lead. Due to the nature of the product it tends to develop fine crazing effects when fired on top of glass.